Orang utans are highly intelligent apes and can be found wild on the islands of Borneo and Sumatra. The orang utan means 'man of the forest' in Malay. They are arboreal creatures - in fact they are the largest ape that live predominantly in the tree-tops. Unlike other apes that are usually found in groups, the orang utan live a solitary life. They spend much of their time sitting in the forest canopy looking out for edible fruits. Once it sees something to its liking, the orang utan would swing over in a leisurely manner to get it. They have an excellent memory and will map out where these fruit trees are so that they may return again during the next fruiting season. 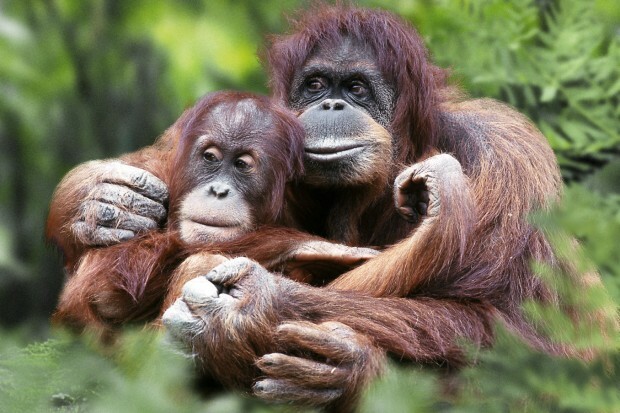 Males and females would mate to produce off-springs but the mother will take care of the baby orang utan on its own for up to six years or more. Because orang utans are solitary animals, the young orang utan must learn how to look for fruits, build nests and survival techniques from the mother. No other orang utans, not even the father, help them learn these valuable survival skills. Orang utans would build a new nest every night to sleep in. They would also use leafy branches as umbrellas when it rains or when the sun is very hot. They are very innovative and will always think of the best ways to get food including use of rudimentary tools. Because of their intelligence and appealing facial features many orang utans have been caught to supply the illegal pet trade. Excessive logging has also decreased the habitat for the orang utans and they are now critically endangered.